Glorious bread! I can’t imagine a day without it and that’s why I was delighted to hear about Dr. Lin Carson’s 90 Day Bread Challenge and excited to be a part of it! 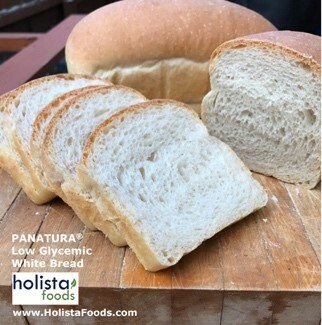 Holista Foods supplies innovative clean label ingredients to bakeries and we have three ground-breaking bread products that I am very excited about. So, we submitted all THREE of our delicious samples. How could we leave one out? It’s like having to pick your favorite child. We love them all and were eager for Dr. Lin and the BAKERpedia team to enjoy them too! Thank you BAKERpedia for having us join in the fun! We sent a loaf of PANATURA® GI, the world’s first clean label low GI white bread. PANATURA® GI is a combination of our patented GILiTE ingredient blend and PANATURA® dough starter. This specially designed dough starter is used for all yeast-raised breads. Dosage: 8% calculated on total flour. These ingredients are combined in a unique way and ratio to create a blend that when added to baked goods, create a natural barrier to the starch. 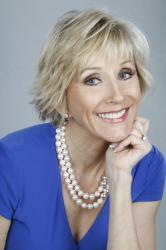 As a result, the capability of that food to cause the blood sugar to spike is lowered. Low GI diets reduce insulin levels and insulin resistance. They also have benefits for weight control because they help control appetite and delay hunger. A typically high GI food (such as white flour based baked goods) can now be made into a low GI food. Most important it doesn’t change the taste or look of the original formula! Glycemic index tests were conducted at the world-recognized GI Labs, Canada, University of Sydney, Australia and the Oxford Brookes University, England. Why is this so important to the bakery world? The consumption and sales of bread is going down because of the growing fear of carbohydrates. White flour is being demonized because it is considered unhealthy. Now there is a delicious solution. Best of all, Dr. Lin and her team gave this a thumbs up and couldn’t tell the difference between ours and traditional white bread. I call that mission accomplished! 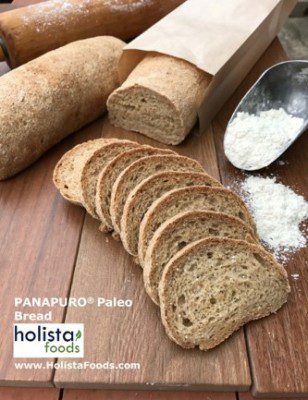 The second bread submitted was a loaf of PANAPURO® PALEO bread that has its own special focus on carefully selected clean and clear ingredients dictated by the Paleo diet and is gluten free and grain free. This bread was made using our versatile specialty MULTIPURPOSE DRY PALEO MIX. The Paleo diet is also known as the cave man diet. Our bread supports the Paleo diet guidelines and delivers artisan style, authentic traditional flavor, high volume, elastic crumb strength, crunchy crust. And as the BAKERpedia team found out, it’s delicious to eat even if you aren’t eating like a caveman! The third bread we sent for the bread challenge was our PANAFREE® Gluten Free bread. It was made from our specialty MULTIPURPOSE PANAFREE DRY BAKING MIX. When added to liquids it turns into an actual dough, not a batter. It can be rolled, sheeted, extruded and stamped on traditional industrial bakery lines or hand rolled. The key to achieving this: fermentation! Nadja Piatka is CEO of Holista Foods which is a joint venture between Holista CollTech, an Australian research driven biotech and food innovation company and Nadja Foods. 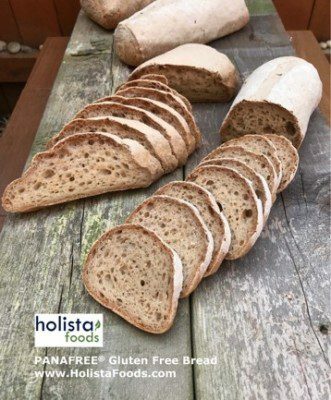 Holista Foods provides groundbreaking ingredients for Low GI white bread and baked goods, gluten free, Paleo, traditional sourdough and other healthy food products based on traditional baking practices which feature clean label, all natural and non GMO ingredients.